Today's idea is to make a pumpkin from three scalloped circles or ovals. All you do is die cut or punch three (3) scalloped circles or ovals. One is the front and the other two are glued to the top one at an angle. Make a stem from a piece of scrap green. I made the leaves with a Martha Stewart punch. The edges were sponged with orange distress ink. The bear is part of a House Mouse Stamp and is a Gruffie (GR1038-Punkin' Head) The mouse dressed up like cheese is also a House Mouse Stamp (HMD1018). The Gingham circle was cut from a smaller die or punch. 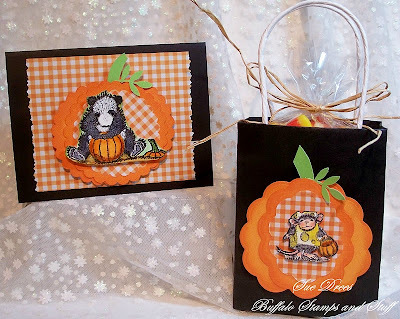 The bag pumpkin is made from ovals and the card pumpkin is made from circles. The bag and matching card are cute little gifts for your favorite "trick or treater"
beautiful done sue, they are looking great. How adorable is this set Sue! I love the little card that matches the bag! Definetly a super cute set! Adorable set, love the bag and the fall theme! Love how you used the scallops for your pumpkins. Adds a very fun twist to your "punkins"!